CINCINNATI -- Eat, drink and repeat. That’s what Taste of Cincinnati is all about. As you prepare to eat all of that delicious food, we wanted to answer some frequently asked questions about Taste. The 2018 Taste of Cincinnati’s dates are May 26-28. The hours are 11 a.m. to 11 p.m. Saturday and Sunday; 11 a.m.-9 p.m. Monday (Memorial Day). Taste will be in the same area as last year, which is on Fifth Street, between Main and just east of Sentinel streets, in downtown Cincinnati. The Rhinegeist Food Truck Alley will return to the Fifth Street ramp to Columbia Parkway. The Taste of Findlay Market area, which will feature food vendors from Findlay Market and “foodpreneurs” from Findlay Kitchen, will return to the Fifth Street ramp to I-71, too. Food from more than 33 local restaurants and 18 food trucks! Best of Taste restaurants at this year’s festival include Alfio's Buon Cibo, Pompilio's, Market Street Grille, McCormick & Schmick's, Island Frydays, Thai Taste, Tickle Pickle, Delicio's and Silver Ladle. Food trucks Adena's Beefstroll, Best Thing Smokin', Empanadas Aqui, streetpops, Red Sesame, Sugarsnap, Hungry Bros. and Slice Slice Baby also won in Best of Taste categories this year. Here’s the full menu. Dozens of vendors will also present dishes at the Taste of Findlay Market, which is sponsored by Sam Adams this year. The Queen City Breeze is Taste of Cincinnati's new signature cocktail for 2018. The breeze is made with vodka or bourbon, lemonade and a mist twist. It is sold in a commemorative glass at booths 122 and 526 $8 for a regular or $10 for a large. Another new addition to this year's food festival is Taste on Tap. The craft beer booth will be located at East Fifth and Sentinel streets. Taste on Tap will feature rotating beers including surprise varieties from Braxton, Rhinegeist, Taft’s Ale House throughout the weekend. 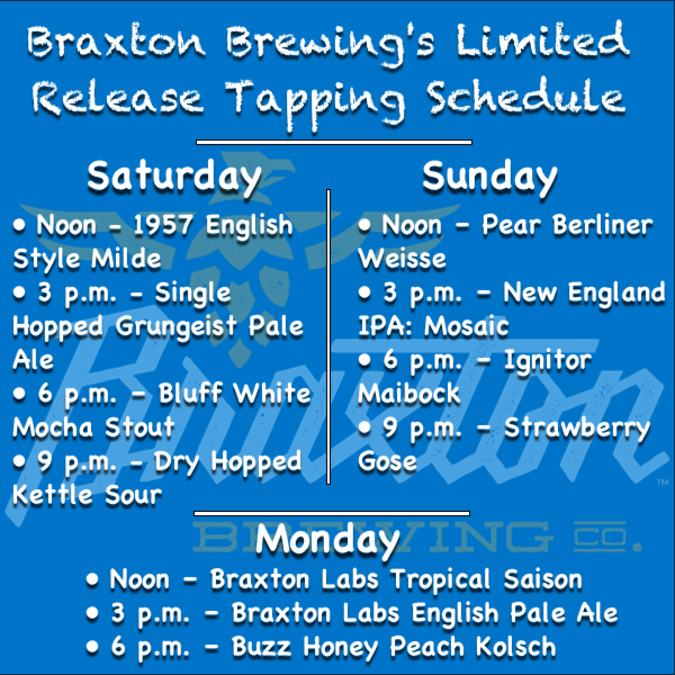 Braxton Brewing is returning this year with regular limited-release tappings at its beer garden, located at the P&G Gardens on Fifth Street between Sycamore and Broadway streets. Check out the schedule for specialty tappings below. For a list of all of the craft beers and drinks at Taste of Cincinnati click here . Isn’t there live music at Taste? Yes! This year Taste will host its inaugural Music Bash featuring performances by the B-52s and Rick Springfield with special guest Loverboy. The Music Bash begins at 6 p.m. Sunday and is a ticketed event. Tickets start at $29.99 and can be purchased online . The concert takes place on Sentinel Street near Culvert Street, which runs underneath the I-71 overpass. Students from Cincinnati’s Art of the Piano Festival will perform at noon Saturday on the main stage. The celebrated rhythm ensemble Cincinnati Poptet will then play standards and show tunes from 11 a.m.-12:30 p.m. Sunday on the main stage. There are 45 live music performances scheduled on five stages as well at Taste. Here’s the full entertainment schedule. There’s so much food! What should I eat first? Oh, we’ve got you. Here’s a list of this year’s Best of Taste winners, plus a quiz to help you decide which Best of Taste dish to try first. Wait, roads will be closed! Do you know which? Check WCPO's latest forecast as we get closer to the weekend for weather updates. Where can I get more Taste information? Oh, you mean besides us? Go to www.tasteofcincinnati.com.